Single band 700MHz 65dB. This Single Band Repeater is designed for 700MHz Cellular Band; It includes a repeater standalone and both indoor/outdoor antenna. Compatible With 700MHz VERIZON. Small Size, Light Weight, Beautiful Repeater. Single Band 1700MHz 65dB. Note:This Single Band Repeater kit is designed for 170MHz Band 4; it includes everything you need to enhance cell phone signal coverage in your location – including indoor and outdoor antennas and all hardware for installation. For the following Service Provider 1 x 65dB Dual Band Repeater. How does it work?. Can I use the signal booster when the outdoor signal has 0 bar?. What is the difference of different outdoor antennas?. These signal splitters are compatible with all 50 Ohm cell phone boosters and repeaters including Wilson weBoost®, SureCall®, Hiboost® and Uniden. They are typically used as a signal splitter to connect multiple indoor antennas to one booster. 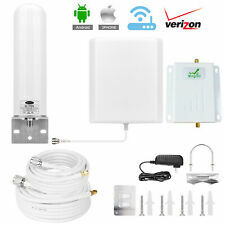 AT&T T-mobile Cell Phone Signal Booster 4G LTE HJCINTL High Gain 700Mhz Band Kit. Condition is New. Shipped with Standard Shipping. Designed for use with Apple iPhone 6, 6s, 7, 8. Pairs with your device's antenna to extend the signal strength up to 3x. The antenna slides out for enhanced reception. Integrated antenna. For a secure fit and improved signal strength. Trending at $10.98eBay determines this price through a machine learned model of the product's sale prices within the last 90 days. Verizon Wireless Network Extender scs 2u01. Condition is Used. Shipping 10.00. All accessories present. Working well. I plugged it in and know that is works amazingly well. I would be keeping if needed. New RV has system already installed. SureCall CM-288W Omni-Directional Outdoor 3db / 4bd 360 Degree Fiberglass Antenna, 698–960 MHz and 1700–2700 MHz. SureCall SC-230W-S Outdoor 10dbi Yagi Antennas. SureCall CM288W Outdoor 4dbi Omni-Directional Antennas. The WiFi Repeater is designed to conveniently extend the coverage and improve the signal strength of an existing wireless network. What's more, its Ethernet port allows the WR177A1 to act as a wireless adapter to turn a wired device into a wireless one. The interior box with two prongs will pick up the signal from your Cell Phone and then transmit it to the exterior 13" Antenna where the signal strength is stronger. Glass Mount Signal Strength Booster Antenna. Farewell to slow Internet and weak connection. Convenient to use and easy to install. Repeater Mode easily boosts wireless range extender to previously unreachable or hard-to-wire areas. Allows wireless signal to reach through walls and windows. Looks like it was never installed. Better Battery Life, more efficient antenna performance can increase battery life. Faster Data Speeds, with a stronger signal, you can stay connected further away from a cell tower. New Wilson 400 75' Coaxial Cable. Condition is New. N-Male Connectors, similar to LMR 400 Coax cable. Shipped with USPS Priority Mail. Porter-Cable(R) PCCR701B 20-Volt MAX. Dual-Power Jobsite Charging Radio 20-Volt MAX Dual-Power Jobsite Charging Radio. AM/FM & aux input for versatile music play. Cordless or corded power options. Trending at $36.29eBay determines this price through a machine learned model of the product's sale prices within the last 90 days.